Laser engraving is a special type of laser marking that produces similar results when compared to traditional engraving methods, but without the use of inks or tool bits that contact the surface material. Laser engraving is best understood in contrast with its sister technologies–laser etching and laser marking. In laser marking, a low-powered laser beam is moved slowly across the target material. The beam slightly discolors the material, creating high-contrast, permanent markings without damaging or compromising the structural integrity of the material. Laser marking is often referred to as laser coloration or laser dark marking, nomenclature which emphasizes the fact that the material is unaffected by the application of the marking. Laser engraving uses a high-powered laser beam to vaporize the surface of the target material, leaving a cavity whose depth can range from one fiftieth to one eighth of an inch. Laser engraving works with a variety of materials, including plastic, wood, anodized aluminum, stainless steel, and glass surfaces. Laser engraving is especially useful for marking parts that are expected to experience high levels of wear throughout their useful life, as the deep penetration of the laser in the engraving process assures the permanence of markings. A third application, laser etching, takes place when a high-powered laser beam is used to melt the surface of the target material, causing it to expand and leaving a visible, raised mark on the material surface. Laser etching can be applied to a variety of surfaces and materials and typically removes less than one thousandth inch of the material surface. Laser cutters are computer-numerically-controlled (CNC) machines. The laser cutter software takes vector files and turns them into mathematical data that tells the controller how to move the laser to produce the input design. The same laser cutting machine can be used for laser marking, engraving, and etching applications. Laser etching, laser marking, and laser engraving are all applications that can be satisfied by an industrial laser cutting machine. Laser machines vary significantly in their function and properties: there are CO2 laser engraving machines which primarily emit low-powered laser beams and could fit comfortably on your desk, and there are also high-powered fiber lasers that have been purposefully designed to facilitate high-volume laser marking and engraving applications in an industrial setting. Different lasers vary based on the specific chemistry that they use to create the laser beam. 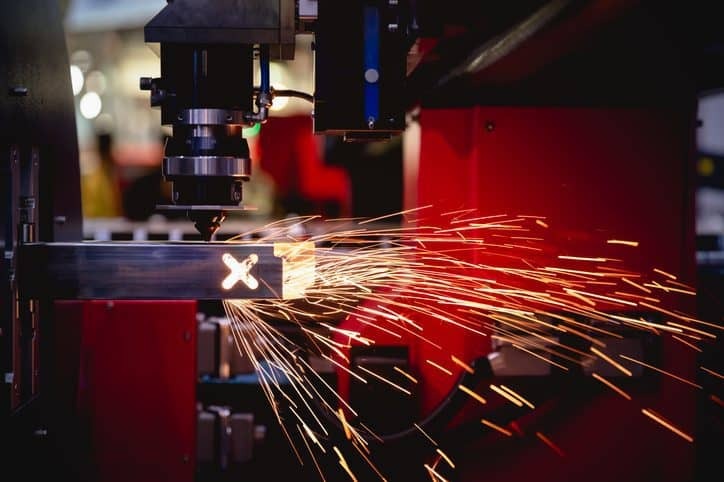 In general, all laser cutting machines have three common components: the laser itself, the control system for the laser, and the marking surface. The operator of the machine uses a software program to modify settings on the laser cutter, including the power output of the laser and the speed of the controller that directs the laser across the material surface. These settings can be used to change the laser cutter application from laser engraving to laser etching or marking. An image chosen for engraving onto a given material must be produced with graphics editing software. These include well-known applications such as Adobe Illustrator, Inkscape, and Adobe Photoshop, and AutoCAD that can produce vector files. Vector files have a special property that makes them ideal for the laser marking application: the images in vector files maintain their clarity and proportions when adjusted to any size. A saved vector file containing the desired image can be uploaded into the laser cutter software and translated into numerical data. The laser cutter’s own software can take that data and use it to program the laser machine’s controller apparatus to produce the provided image using the laser. Conceptually, you might think about laser engraving machines as being similar to 3D printers. They both use digital designs to automate a creative process, but while a 3D printer functions by printing plastic blocks in the programmed pattern, the laser machine uses a programmed pattern to take something away from the material–leaving engraved text or a lasting image in its place. Laser marking for aerospace parts represents an exciting new area of application for laser marking and engraving technologies. The aerial vehicles assembled by major contractors in these industries incorporate thousands of parts that travel through a complex global supply chain from their point of origin to the manufactured product, with numerous stops along the way. In order to promote quality and accountability throughout the supply chain, parts-makers in this sector are using laser engraving machines to mark products with barcodes and serial numbers that establishes their traceability. Low Variable Costs – Chemical etching is a frequent substitute for laser engraving and entails the use of a strong acid to mark the material. Companies that use this method need adequate wastewater treatment or an appropriately certified third-party company to responsibly dispose of chemical waste, and each new image requires a brand new stencil to be produced. In contrast, laser engraving machines have zero inputs besides the power it takes to run them. This translates into low and predictable costs for manufacturers. Versatility – From the thousands of feet of wiring that run the entire length of a Boeing 747, to the back-lit panels in the plane’s cabin, laser marking can be applied to every component and part in the global aerospace supply chain. Permanent Markings – Contractors that build parts for the aerospace and defense sectors frequently seek to demonstrate their commitment to quality in manufacturing through certification with the SAE AS9100D-2106 quality standard. This standard combines the general direction of ISO 9001 Quality Management Systems with specific guidance for the aviation, space and defense industries. Under the guidelines of SAE AS9100 D-2016, parts manufacturers are encouraged to establish traceability of parts throughout the supply chain by assigning unique identification numbers to parts. Traceability markings that are applied to parts during the manufacturing process must be permanent, especially if the part will be exposed to extreme conditions such as high or low temperatures or other environmental hazards (sand, snow, etc.). The laser engraving process removes up to an eighth of an inch of matter from the material surface, assuring a permanent marking. 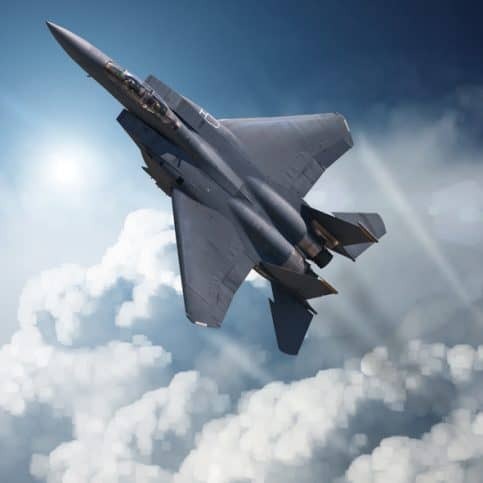 Aerial vehicles like this F-15 fighter jet are made from thousands of components, including entire systems and subsystems that are contracted out to expert manufacturers around the world. Laser marking and engraving can be used to produce permanent, high-contrast traceability markings for each component of the F-15, assuring that any defective part can be traced back to its origin. Laser engraving machines are comprised of a laser, a controller, and a surface. Designs from vector files are fed into the laser machine software, programming the controller to move the laser in the correct pattern that produces the image on the surface. The operator can modify the controller speed and laser intensity to switch between laser marking, laser etching and laser engraving applications. Laser engraving offers an effective, low-cost means of producing traceability markings for aerospace parts, helping to establish quality and accountability throughout the supply chain. Contributing Author: Artin Teymourian, Hai Tech Lasers, Inc.
For the past 5 years, Artin has immersed himself in the design and development of custom laser marking and engraving machines. By running a family business, he is able to work closely with clients to provide them with customized solutions for their specific needs. Previously he worked as a Postdoc at UCLA developing hardware for the latest Dark Matter and Neutrino Detection experiments. As a native Angeleno, Artin enjoys discovering the multicultural restaurant scene of his hometown.